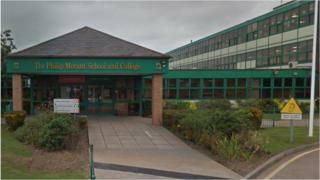 Two executive head teachers at a north Essex academy have been suspended while an investigation is under way. The pair work at the Thrive Partnership Academy, which runs the Philip Morant College in Colchester and the Colne Community College in Brightlingsea. A spokesman confirmed that "Nardeep Sharma and Catherine Hutley of the Thrive Partnership Academy Trust have been suspended". This was a "neutral act" while facts of the case are established, he added. "We have established interim arrangements for the leadership of our schools," the spokesman said. Mr Sharma OBE is the academy's chief operating officer. Colchester MP Will Quince said he had been contacted by a number of parents over the past few weeks but could not get an adequate response from the academy's leadership over their concerns. He said: "The school didn't seem very keen to answer what appeared to me to be fair and legitimate questions. "When a member of parliament asks you a legitimate question, you should be as open as possible. "I have spoken to my neighbouring MP Bernard Jenkin and we're going to escalate this to the Secretary of State for Education."